BOSTON, MA (CelebrityAccess MediaWire) — The Infamous Stringdusters have announced list of dates for their 2013 Ski Tour which will hit some of the leading ski towns in the Rockies this winter. The itinerary includes stops at Vail, Colorado, Park City, Utah, and Jackson, Wyoming, among others is sure to provide the band with a few day soff to hit the slopes. The tour is sponsored by POW (Protect Our Winters), Icelantic Skis, Oskar Blues Brewery, and Mountain Khaki who will be staging special events and giveaways along the tour. 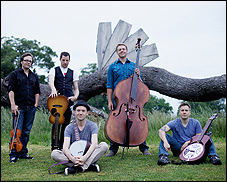 In addition, The Dusters are preparing the launch of The Infamous Stringdusters GoPro Live Virtual Tour with an exclusive video posting at a different online location each week filmed during their recent fall tour. The videos will offer stage perspective and a behind-the-scenes look at the tour.